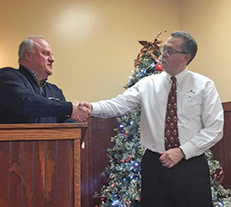 Board of Trustees president Tim Albro (left) honored Roy Craig (right) for his 20 years of service as PLACES Inc.’s executive director at the staff holiday party on December 12 at Company 7 BBQ in Englewood. Albro cited Craig’s patience and kindness, recalling a time when they toured adult care facilities and Roy made an effort to stop and chat with each of the 36 residents. “He knew them all by name and would bring up something they had discussed before,” Albro said. “You could see he truly cares about the well-being of each person. February is the time when PLACES recognizes its clients, tenants and residents who have worked hard to achieve their goals in education, vocational training, community service and recovery over the past year. Here are honorees who received awards at the Client Recognition event on February 13. PLACES couldn’t provide the special events that make life more enjoyable for our residents, clients and tenants without the help of our generous sponsors. We’d like to recognize those people and organizations who provided their support in 2018. In the 20 years since a landmark study, what have we done to protect kids from the mental health risks of adverse childhood experiences? We’ll continue exploring this topic in the next issue. From 1995 to 1997, the Division of Violence Prevention at the Centers for Disease Control and Prevention (CDC), in partnership with Kaiser Permanente, conducted a landmark study involving more than 17,000 participants. They found a clear link between adverse childhood experiences (ACEs) and behavioral health and substance abuse issues. Chronic exposure to stressful events can disrupt children’s neurological development and impede their cognitive functioning. As an organization concerned with severe and persistent mental illness in adults, PLACES wants to increase our community’s understanding of what can cause these problems. Adverse childhood trauma affects physical health, emotional balance, academic and professional capabilities and often interrupts lives with early death. These traumatic experiences include sexual abuse or assault, parental loss, neglect and serious illness. Heart and lung disease, cancer and diabetes, along with many other health risks and adult diseases, are related to the number of ACEs experienced during childhood. 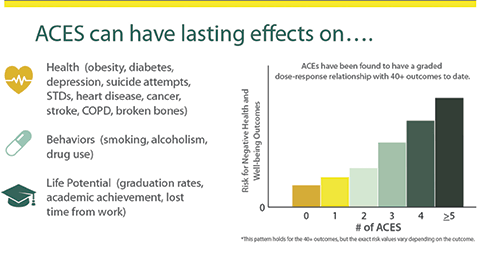 As a child’s number of ACEs goes up, so does the likelihood of experiencing serious health issues from childhood through adulthood. Life doesn’t happen without stress. But while some stress benefits children and prepares them for future challenges, trauma and chronic, unrelenting stress alters a child’s developing brain. During the first three years of life, the brain’s neural pathways connect more than during any other time. Repeatedly hearing alarming sounds, seeing visions of violence and having feelings of instability creates an amplified sense of alertness and toxic stress. Those exposed to toxic stress have elevated heart rates even when at rest. The mind and the body work in harmony to adapt to stress using habits, impulses and mental attitudes to ensure survival, to feel better and to compensate for what is needed and not provided. Common “reactionary” coping skills include: yelling, crying, lashing out; shutting down; working to please everyone; blaming and manipulating others. Trauma causes the brain’s alarm system in the amygdala to engage, triggering fighting, running or freezing responses. But while adults use coping mechanisms and previous experience to regulate their initial reactions to trauma, children haven’t developed these complex thinking processes, so they react differently to trauma. Continual stress appears to cause more damage than a one-time event. Without the reassurance of a compassionate adult, stress and trauma lay unresolved in children. Stores of stress-related hormones released by the brain’s activated amygdala stimulate diseases. How Frequent Is Childhood Trauma? The National Child Traumatic Stress Network estimates that two-thirds of Americans experience at least one traumatic event before age 18. More than one in five reported an ACE score of three or more. Exposure to four or more adverse experiences in childhood increases the likelihood of alcoholism, drug abuse, depression and makes a person 12 times more likely to attempt suicide. Those with an ACE score of six or greater predictably die 20 years younger than the rest of the population. Knowing and understanding ACEs empowers a person to heal. Awareness prompts the development and use of resiliency and other protective factors that defend against the symptoms of ACEs. Protective factors for children include having a resilient parent — someone who understands good parenting and child development, who nurtures and encourages attachment. Clinical staff grows to serve the behavioral needs of constituents. Four new professionals have been hired for the PLACES clinical care team, led by Director of Clinical Services Brian Wlodarczyk, LISW-S, and Clinical Services Coordinator Jennifer Scott, LPCC-S, LICDC-CS. Their diverse and extensive experience will add strength to our ability to provide outstanding service to the people who need it most. Irene Lader joined PLACES in November as assistance manager at Marty's House. She received a Master's degree in Social Work in 1991 and has over 30 years of experience in the fields of mental health, chemical dependency and criminal justice. 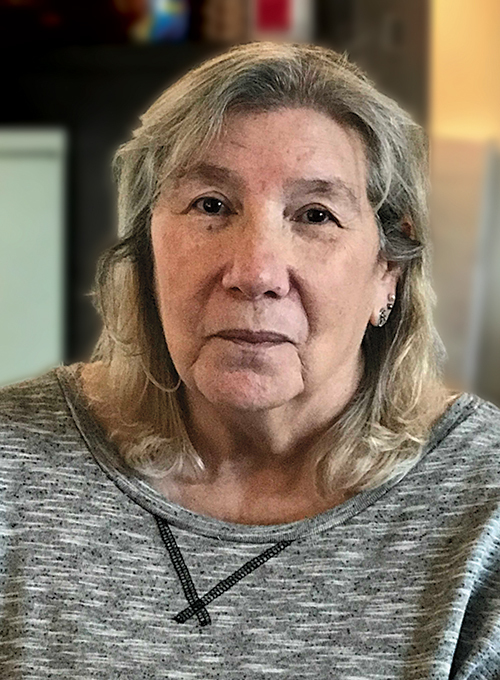 During her long career, Irene worked at residential programs with diverse populations, from emotionally disturbed, latency-aged boys to mentally ill adult offenders coming out of jail. She was the director of a day treatment program for chemically dependent women and established chemical dependency groups for women at three jails in Sacramento during an internship for her master's degree. 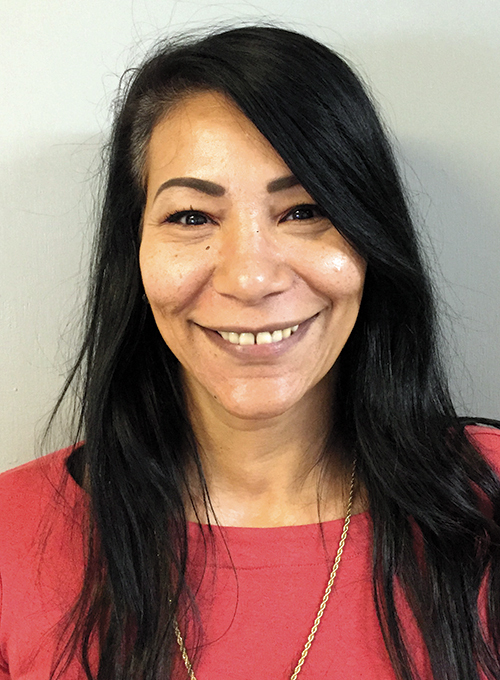 Irene has been employed as a clinical social worker at the main Sacramento jail and Vacaville prison, doing 1:1 counseling, crisis intervention and leading groups such as one for mentally ill inmates doing life sentences without possibility of parole. Christine Escribano was promoted to assistance manager at Gascho Gardens in December, having worked 14 years at PLACES as an advisor. Originally from Chicago, she spent her growing up years in New York City and Puerto Rico, then returned to Boston where most of her family lives. Realizing that buying a home in Boston was prohibitively expensive, Christine was attracted to Dayton in 2003 when a close friend spoke to her about our reasonable cost of living. “I got on a plane that weekend and came here,” she said. “Six months later I relocated and was hired by PLACES at a job fair two months after that. I was happy to find a job doing what I love to do and serving a community that needs help with compassion and support.” By being patient and working every shift, Christine learned all she could to be helpful to clients and staff. The result is her promotion to assistant manager. Nicole De La Torre Salas joined PLACES in September after graduating from Albizu University in Miami, Fla., in 2017 with an M.S. degree in Mental Health Counseling. She did her internship at ABCs for Success, where she worked with the elderly, abused women, children and adolescents. Nicole also worked at A Great Life Services, where she did intakes, treatment plans and counseling for a diverse population. Her clinical orientation is cognitive behavioral therapy and person-centered therapy. Nicole currently provides case management services to help PLACES clients maintain housing and improve their daily lives. 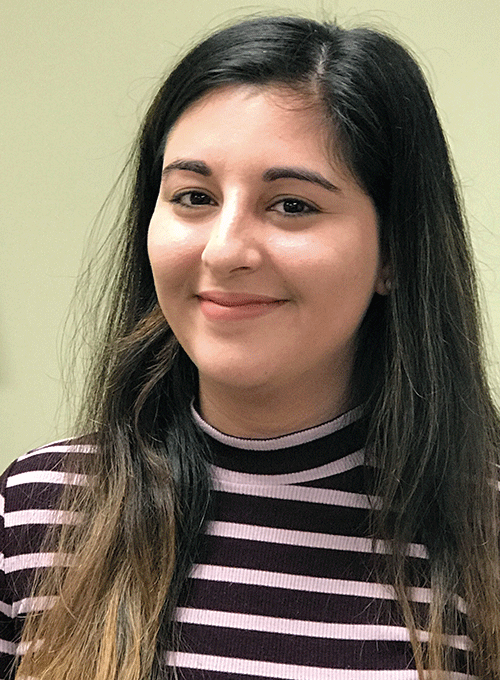 “I’m motivated to continue learning as much as I can in the mental health field in order to provide my best to those who need my services,” she said. 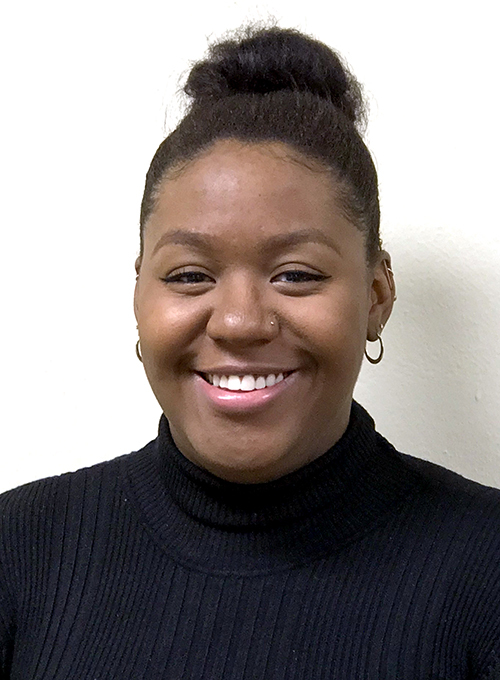 Raylecia Anderson-Rosenkranz returned to PLACES in December as a case manager for the Supportive Living Program after an extended maternity leave. She is currently enrolled at Sinclair Community College in the Human Services Associate Degree program. Raylecia has dedicated her time and skills to serving populations that are often overlooked. She began working with developmentally delayed and geriatric populations in 2012, then found her place in mental health in 2014. “I pride myself on my commitment to ensuring the best quality of life possible for everyone I serve,” she said. Annual holiday event is culmination of year’s festivities. 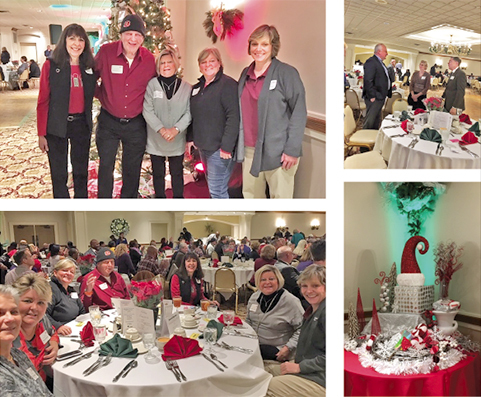 More than 100 residents, clients, tenants, staff and board members enjoyed a festive evening of dining and dancing at the PLACES Annual Holiday Party on December 6, 2018, at the Kohler Banquet Center’s Lincoln Room.